The Bump Fighter Razor Ultimate Package. Big Savings, The Best Razors. As some of you may know the Bump Fighter Shave Gel has been discontinued. We are currently in the process of creating a new shaving gel to replace this older outdated product with a better working and more up to date shaving gel. If you have used the older shaving gel in the past and would like to take part in our focus group please contact us at questions@1shave.com (copy and paste) and leave us your name, phone number, email and mailing address so we know where to send your product to. Great savings accompanied with a great product is a win win situation! We are the only company who offer such great packages for these products! This Combo is regularly $63.53 but is on sale for only $54.00 and save 15% !! The ultimate all in one package! Everything you could possibly need is right here! This is a great starter kit because it comes with all you could need and then you can decide which items you prefer and then you can only re-order those items..
Bump Fighter® is the only shaving system specially designed to prevent facial shaving bumps. Out of production, LIMITED quantities left. First come first served. Bump Fighter® Cartridge Blades with Bump Guard® technology help minimize skin irritation associated with shaving. Bump Fighter® is the only disposable razor specially designed to prevent facial shaving bumps. Less than $1 per shaver. 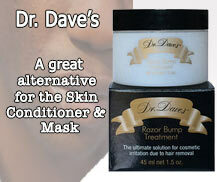 This treatment relieves the discomfort of razor bumps and prevents them 100% ! This has replaced shaving gel, treatment mask and skin conditioner.